With the release of Windows 8, we are going to see a steady stream of streaming media apps make a splash on Windows 8 and the Windows Store. Netflix got in early, and this week brought a Hulu Plus app and new versions of CyberLink PowerDVD. The Hulu Plus app takes full advantage of the Metro/Modern/Windows 8 UI with touch controls, pin to Start screen, and Snap View. As a Hulu Plus app, it is only useful to Hulu Plus subscribers, so fortunately the free Hulu is just a website away. At Hulu, we are relentless about creating beautiful, intuitive and engaging experiences that help you find and enjoy popular current season TV shows whenever you want, on whatever device you want. Which is why we are so proud to announce the Hulu Plus app is now available on one of the newest operating systems: Windows 8. 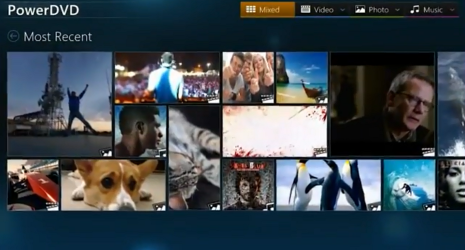 CyberLink has announced two new versions of PowerDVD with the release of PowerDVD 12 and PowerDVD Mobile for Windows 8. PowerDVD 12 is a fairly standard upgrade to their traditional x86 desktop software. For $14.99, or for free with the purchase of PowerDVD 12, PowerDVD Mobile brings some basic video and photo editing, and MPEG and MKV support to the new Windows 8 UI. The company is also promising an Ultra version of PowerDVD Mobile for Windows 8 is in the works, but they are not offering any specific details at this point. Unfortunately, PowerDVD Mobile does not support Windows RT, so anyone who drank the Redmond Kool-Aid and picked up a Surface is going to have to look elsewhere for their MKV fix. CyberLink Corp. (5203.TW), a provider of innovative media creation solutions, today launched an updated version of its award-winning media player, PowerDVD 12, along with newPowerDVD Mobile to ensure users of Microsoft’s upcoming Windows® 8 operating system continue to enjoy a premium entertainment experience on their new Windows 8 PCs.